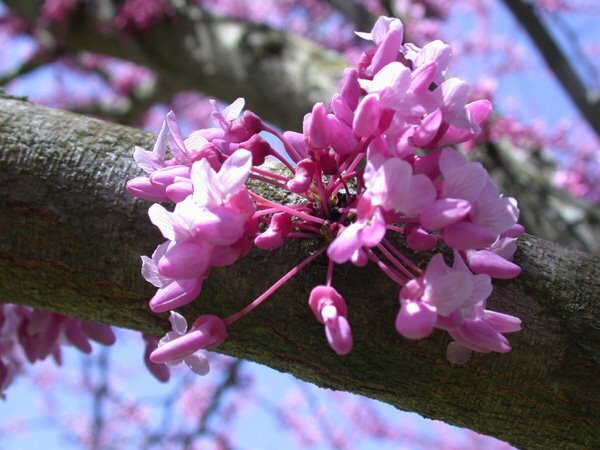 Cercis canadensis or red bud is a small tree that displays (as in the picture) an abundance of purple blossoms in the spring. I have always wondered why it was not called pink bud or purple bud! It has large heart shaped leaves during the summer and long seed pods in the fall. The tree is often called a Judas tree because of its close relationship to the species thought to be the one from which Judas Iscariot hanged himself. Redbuds sometimes grow to a height of fifty feet but more often are in the form of a small shrub fifteen to twenty feet high. Judas would have a difficult time hanging himself in the redbuds that grow in Gilmer County. 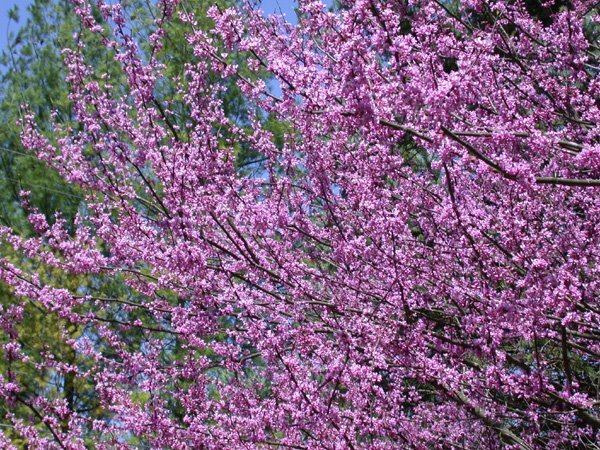 It is a joy to see the blossoms of the redbuds appear each spring. The dogwoods are also bursting forth today. This is a great sunny day in Glenville. We are having intermittent warm rains that gently encourage the growth of the spring plants. For the past several days under the white ash in the backyard, the king of the fungi has appeared. Yes, it is the wonderful morel! 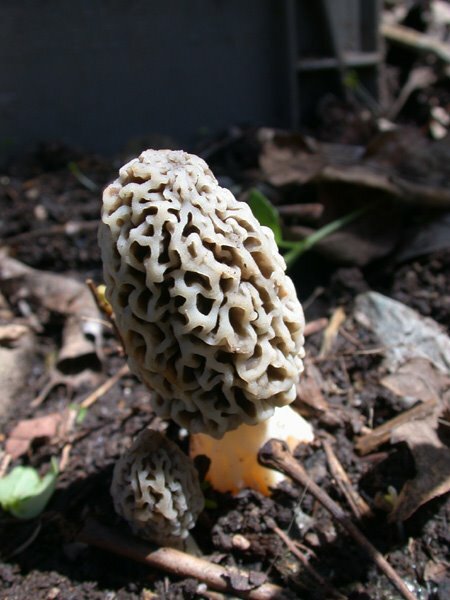 The True Morels, (Morchella esculenta elata, and semilibera ) are not only some of the most delicious wild mushrooms in North America but they are also some of the easiest to safely identified. * Cut lengthwise it will be hollow from bottom of stem to top of cap. 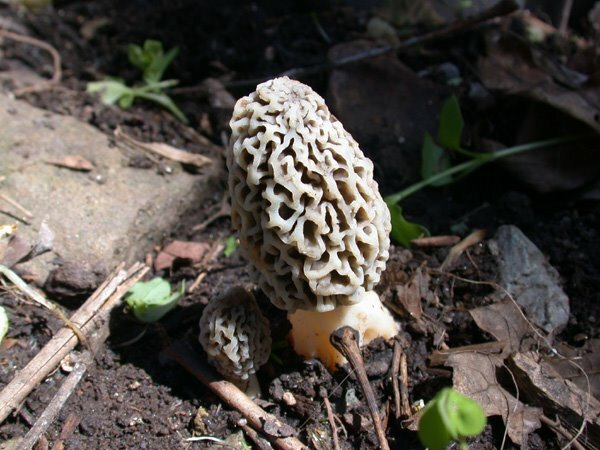 It'll look like a rubber mold, prompting comments from non-morel lovers. * On most Morels the cap is longer than the stem. * Stem has little bumps both inside and out. 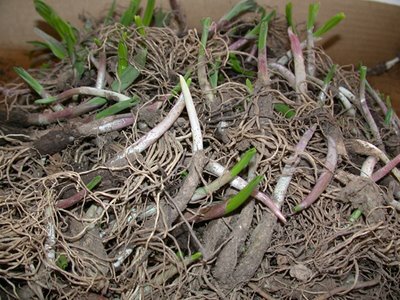 Stalk is usually a lighter color [sand, yellow or grayish color]. You can eat any mushroom that grows. Once! But remember...There's "No Cure" for mushroom poisoning! If you have a bad reaction, you will either live, or die. Either way you're going to regret it! Go with seasoned hunters to learn first. German folklore attributes the origin of morels to the Devil. Offended by a very wrinkled old woman, he transformed her into this mushroom. Ever since, calling a woman a morel in Germany has been a major insult. It was sunny and warm yesterday in Gilmer County. The perfect spring day provided the stimuli for growth of one of my favorite wildflowers in our gardens. 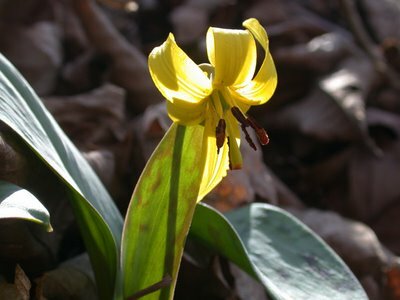 There emerging from the leaf litter were the blossoms of the trout lily. 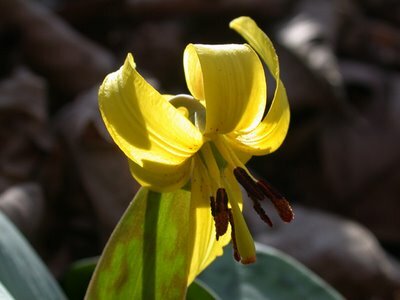 Trout Lily gets its name from the spotted leaves resembling the spots on a trout. The plant pushes through the soil, blooms, produces seeds and dies back, all before total leaf out of the forest. From seed to blooming takes 4-7 years, and a mature plant may not bloom every year. 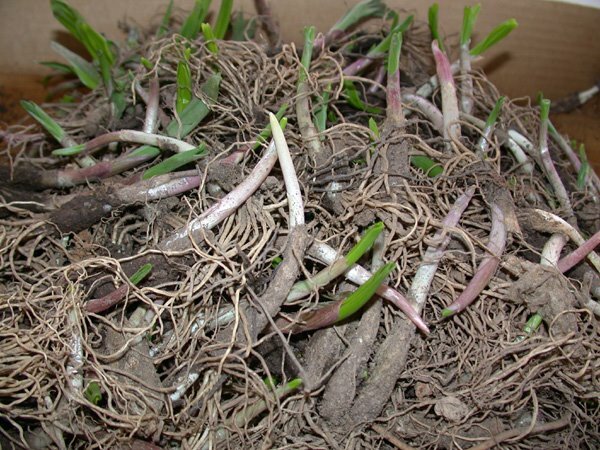 The corm gets larger and goes deeper into the soil the older it gets, sometimes going down well over a foot. Until the corm reaches flowering size, it produces only a single, ground level leaf per season. Flowering plants bear two basal leaves. The species spreads not only by seeds but also by offshoot runners from the corms, forming extensive colonies, carpeting the forest. Most plants in any given colony are single-leaved, not yet reproductively mature. In one study the colonies were found to average nearly 150 years in age and were as old as 1,300 years. The yellow flowers track the sun and more or less close at night. The three sepals (outer whorl), which may be tinged with brownish red on the outside, and three petals (inner whorl), which may be spotted at the base inside, are otherwise similar In bright sunlight all may recurve so strongly as to give the flower an almost spherical look. Once used as a cure for hiccups, Roman soldiers also used this plant as a cure for foot sores and corns. I am keeping you all updated on our blooming in the shade gardens. Today I noticed the Dutchman’s Breeches are in full bloom. This plant has only basal leaves that are finely divided into narrow segments. 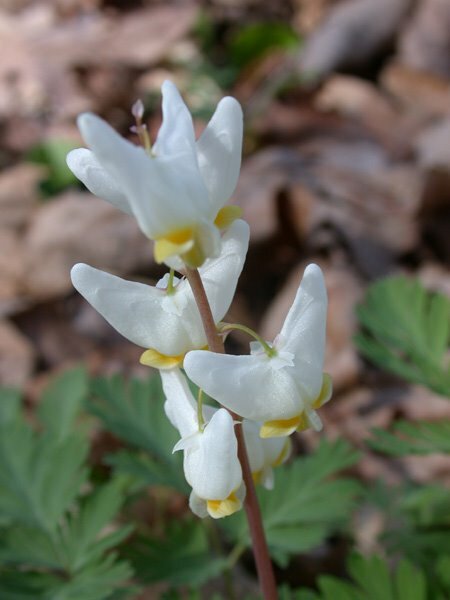 Blooms first appear in early spring and actually have 4 petals. The inner pair is very small and the pair of outer petals form a swollen “V” making the hanging flower look like a pair of breeches hung up-side down. 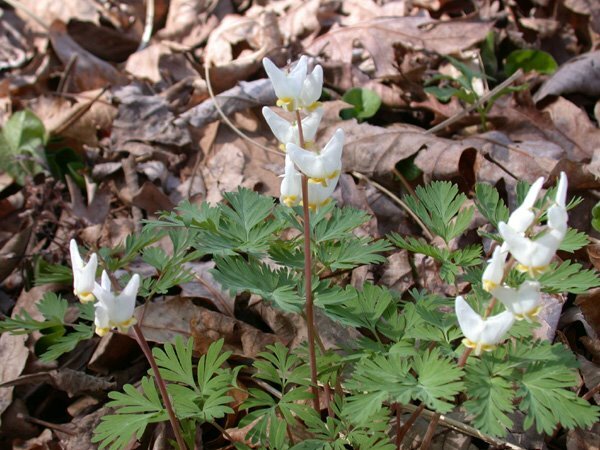 Native Americans and early white practitioners considered this plant useful for several conditions including syphilis, skin conditions, and as a blood purifier. There are indeed several alkaloids that may have effects on the brain and heart. 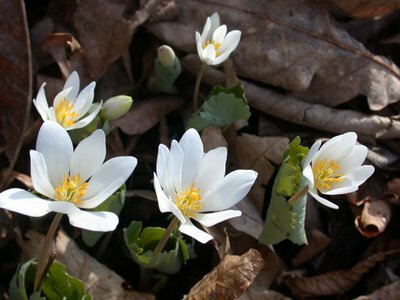 Bloodroot works great for the shade or woodland gardener. 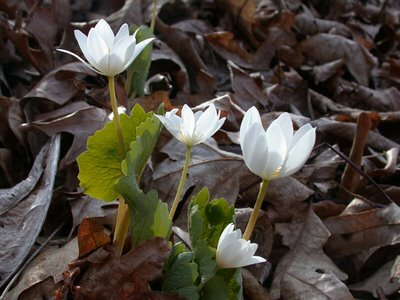 The early white flowers are a welcome sign that spring is on the way and the bold, green leaves will persist through the growing season. As I have mentioned earlier, life is a great adventure. The adventures make the fodder for a plethora of stories! Life is full of stories and they become more important as one gets older. We were in Hinton on Friday to do a science presentation. In Hinton, we tried to find a restaurant to have lunch before our 2:15 presentation. No cute coffee shop nor a bakery was to be found. We did find an establishment directly across from the middle school called Kirks. Kirks was located in 2 rooms of an old building- the first room was supplied with a variety of vegetables- green tomatoes, strawberries, ramps (which we purchased as you can see from the picture above)- and pop/juice. When you turned the corner there was a series of booths located in a small room with a window leading into the small kitchen. We ordered from a very friendly local "food preparation expert" and could hardly afford the fare but we did splurge and ordered lunch. Hot dogs were $0.99, fries 0.55, etc. Yes, the prices were out of the 60's. We happened also to notice that an altar was setup below the window leading into the kitchen. There was an open Bible with a series of plants around it and a couple of candles! I am not certain if this was located there to ward off food poisoning (chuckle) or just to give the hungry a spiritual lift! Food was tasty and well prepared. Be a sweetie and wipe the seatie. Clean it up and make it neat. In a rush.... take time to flush. He smiled, handed me the copy, and ran back to reestablish his poetry on the bathroom wall. He was closing early because some friends were stopping by to go bass fishing. Kirks was a joy to experience. I just returned this week from the Black Hills of South Dakota. 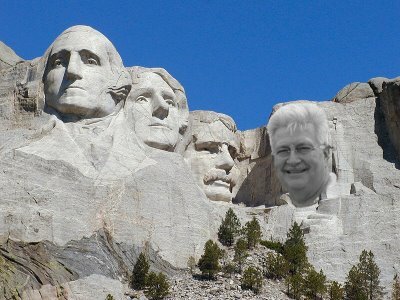 I am currently posing for a new remodeling of the famous monument for the National Park Service. I will not replace Lincoln as seen here. Lincoln will be carved next to Washington for a more prominent location for the sixteenth President of the United States. After a lengthy telephone conversation, President George Bush finally convinced me that the nation needed to include “the common man” in this patriotic monument. After several “rock modeling” screening, I was chosen out of a plethora of applicants. I do not think the President had much to do in the selection process. I really think the First Lady made the final selection. My guess it was my “stud muffin” haircut that got me the job. If you believe this, take two aspirins and rest!